I am very late in showing you guys these lovely polishes from KBShimmer, but they are currently available so at least there's no waiting if you decide you need them now! Today I have two polishes from the Fall 2016 Collection to share with you, along with a review of some of her hand and body care items! For both polishes I used one coat of KBShimmer Clearly on Top for my pics. This is in my top 5 favorite topcoats and I reach for it often! For the matte photos I used my absolute favorite matte topcoat, KBShimmer Oh Matte! Fright This Way is a black jelly polish with purple glitter and holo shimmer. This one is perfect for Halloween! It has a lot of depth and the formula was easy to work with. It's opaque in 2-3 coats depending on how heavy your hand is. I used 3 light coats for the photos. Note: with the purchase of this polish you also get a small bag of purple bat glitters! I forgot to take a picture of these but plan on using them in some nail art soon! Sweet Devotion is a very happy polish. It was inspired by candy, so of course it's a happy polish! It is a white crelly base filled with various shapes of glitter in orange, blue, green, brown, red and yellow. The formula was so smooth and easy to work with! KBShimmer definitely knows how to make a great crelly glitter! I used 3 thin coats for this one. I apologize for not having outside pictures of this one. A storm rolled in and I lost my lighting! Now for some of the hand and body care items! Some of these products I have received for review and some I have purchased myself. And some are both - received for review when I had previously purchased on my own! Picture Perfect Cuticle Cream - this is a product I absolutely love. I purchased the unscented and Citrus Blast scents on my own shortly after it was released and received Paradise to review. They leave my skin feeling moisturized but don't leave shiny, greasy look that make photos unattractive. I often use my clean up brush to apply it around my cuticles before taking photos. I am extremely sensitive to scents so I love that there is an unscented option. I use it most often because of my scent issues. Citrus Blast is a nice orangey scent. I purchased this one because fruity scents don't typically bother me. This one is on the sweet side of orange and doesn't bother me all the time, but it does occasionally. I'm sure it wouldn't bother most people, but wanted to mention it for those who have picky noses like me. Paradise is a scent I wanted to try but was leery of. I absolutely love lime everything but sometimes when lime scents are introduced other things are paired with it that bother me. I am thrilled to report that this one smells just like a fresh batch of cut limes with a hint of sweetness of pineapple. I'll definitely be ordering more items in this scent. Handmade Soap - I'm not typically a bar soap person but this one left my hands feeling so much better than they do after using my normal soap. I can definitely see it being great in the tub and for shaving my legs! Again, I was leery of this scent but it was very light and didn't bother me! I really liked it and the fact that it wasn't overpowering. I could see me purchasing this scent in other products as long as it stays as light and refreshing in other products like it is in this one. Sugar Scrub - This is a product that I received for review that I have previously purchased myself. I love the scrub and the way it leaves my skin feeling. It's great to use for at-home pedis or when taking a nice relaxing bath. The raspberry vanilla scent is just what it sounds like, a nice mix of vanilla and raspberry. This one didn't bother me either. Mani Shot - This is another product I received that I have previously purchased. I've purchased several of these and love them. They are a great way to pamper my hands, especially with all the nail polish remover I use. They leave my hands feeling moisturized and refreshed! The only two scents I have tried are peppermint and watermelon. Neither one has bothered me and they fill the room with such a nice aroma! What do you think? Do you have either of these or any others from the Fall Collection yet? There are still a few that I want! These are all currently in stock at KBShimmer! You can purchase KBShimmer products - including nail polish, nail vinyls, scrubs, lotions, remover and more - at KBShimmer's website for US orders and at Harlow & Co. for international orders. 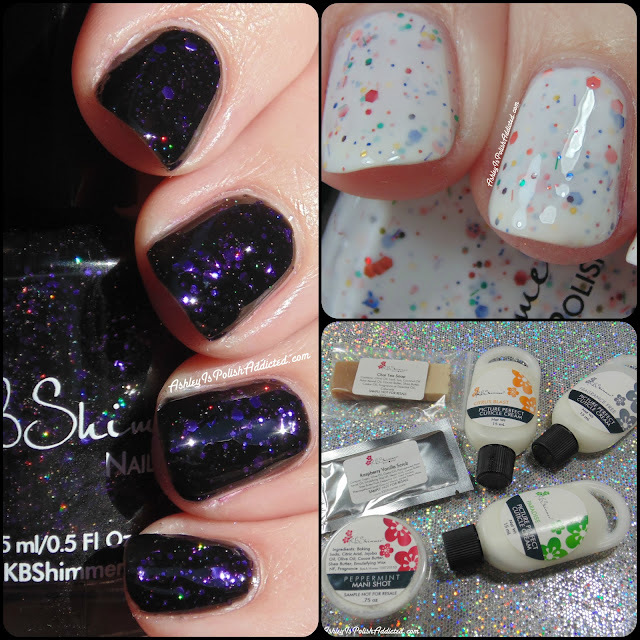 Also make sure to follow KBShimmer at the social media links below!